D. Waldman, Joseph Cornell, New York, 1977, pl. 43 (illustrated). New York, Museum of Modern Art and Art Institute of Chicago, Joseph Cornell, January-March 1982 (exhibited only at the Art Institute of Chicago). In many of his small objects dating from 1932 to 1933, such as Untitled (Jacks), Cornell encouraged the viewer to interact with, and handle the work, enabling both movement and chance within the structure. As with Duchamp's penchant for chess or the countless games of Cadavre Exquis played by Joan Mir©o, Man Ray and Yves Tanguy, Untitled (Jacks) is Cornell's version of the game motif that was popular amongst both Dadaists and Surrealists. 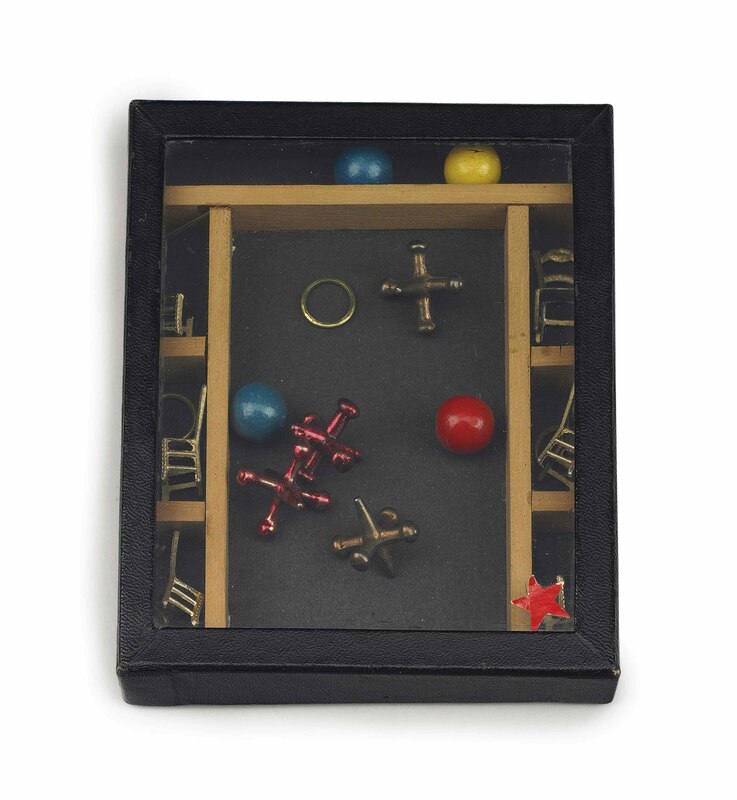 Creating his own signature version of the theme, Cornell added other toy objects, such as dollhouse chairs, a star and rubber balls to his work. Formally, Untitled (Jacks) establishes the basic compartmentalized structure of Cornell's later boxes-creating post-and-lintel configuration within the rectilinear confines. Yet, more so, it introduces the sweetness and open play of classic children's games, which the artist was so fond of, and subsequently played a major factor in many of his mature works, from his Slot Machines to his Dovecotes.